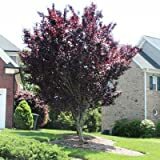 Crimson king maple growing tree of the genus Acer also known as Acer platanoides, Crimson king maple perennial deciduous used as ornamental shade tree, grow in temperate climate and growing in hardiness zone 2-8. Leaves color purple-red green in lobed shape maple leaf shape. Acer platanoides Crimson King RED LEAVES Seeds! 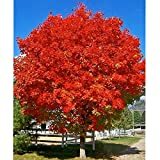 Crimson King Maple - 6-7 ft.